A team of sixteen volunteers. 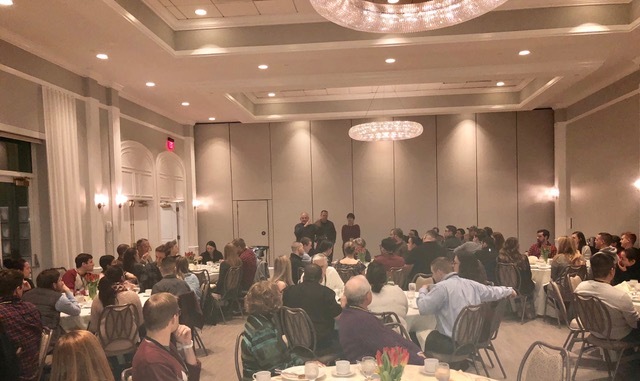 The 16th annual mid-winter Marriage Retreat is now in the books and we’re still filled with gratitude and wonder as we reflect on the incredible ways God met us collectively throughout the weekend. 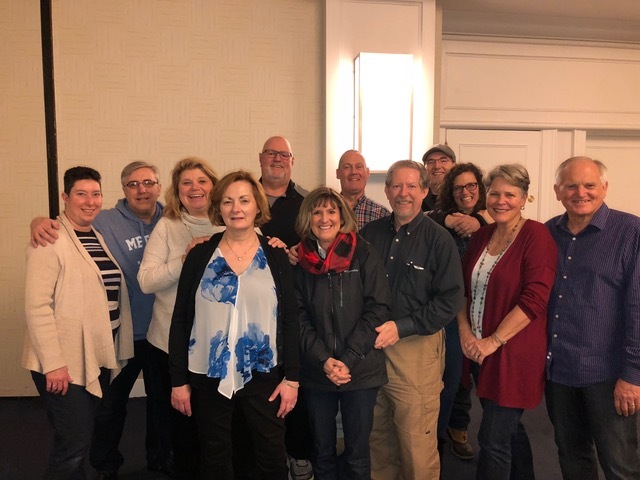 Within hours of the 2017 conference’s end almost a year ago, Paul’s visionary gifts kicked in as he began dreaming about the 2018 conference. The theme, “But God…” crystalized in his mind quickly. Though not commonly used in the context of marriage, this passage from Ephesians 2:1-10 describes our lostness and our hopelessness due to our trespasses. BUT GOD . . . being rich in mercy . . . rescues us. Reality framed in hope. Paul, Barbara Steele, Kelly Plosker, and Gabby Warren invested dozens of hours in the months leading up to the conference getting everything ready. Publicity. Registration. Desktop publishing. Decorations. Goody bags. Lining up workshop leaders. Interfacing with the hotel. Rooming lists. Conferring with the worship team. Approaching couples to give testimonies. Arranging airport pick-ups for those coming from afar. The details seem endless, but this team is top shelf and they got it done with excellence. Kelly Plosker created a warm welcome at the registration desk as couples checked in and picked up their folders, name tags, and Paul’s World Famous Chocolate Chip Cookies. We all breathed a sigh of relief when the accu-weather forecast for the weekend predicted temps in the 40’s and rain but no snow. This is one time I’m thankful for no snow. :) Amazingly, the forecasters nailed it and weather that nicely supported the weekend was enjoyed by all. Returning to “Gurney’s” on Goat Island in Newport, RI, we were served well by the attentive staff in this lovely setting. Kelly Plosker once again did her magic in the ballroom with decorations that created a warm “somebody cares” atmosphere. After checking in at the front desk, and then at the H.I.M. registration table (ably tended by Dave and Cynthia Tipton and Gabby Warren) between 4 and 7:45 Friday night , the conference launched at 8 p.m. with an energetic worship set led by Dave Bullock and his team, consisting of Erik and Marlene Kerr and Paul and Lyss Gandy. The high level of professional musicality was eclipsed only by the genuineness of the worship—and that repeated itself in all four plenary sessions. The “goodie bags” and vases of spring-fresh red tulips created an ambience of thoughtful consideration for each attendee. John Nugent, H.I.M. board member, served as emcee during the weekend. The house was packed and energy was high. The worship team, led by Dave Bullock, knocked it out of the park. Marilyn Nugent gives a warm welcome to Bill and JoAnne Shore, our longest married couple at 65 years! The audience was consistently engaged and responsive. Almost twenty years in to our friendship with Dave and June Bullock, it was a joy to be partnering in ministry again this weekend. Bullock led worship the first 6 or so years of the marriage retreat. Don Hasselbeck made a cameo appearance during Saturday morning’s plenary session, and spoke on the similarities between winning “on the field” and winning in marriage. He vulnerably shared from his own life journey and was really appreciated by the listeners. Throughout the weekend, three couples shared their “But God . . .” stories of redemption very powerfully. Don Hasselbeck engaged the crowd with his compelling testimony. “After hours” Saturday night was the debut of the “Couples Awards Night.” Couples wrote answers to questions such as, “Share something unforgettable about your engagement” or “Share something about your spouse that no one would know” and after a committee sorted through them, the top five answers for each question were announced at the “after hours” party. Sipping coffee, munching on homemade cookies, and rolling with laughter, the “closer” was a great success. The non-programmed Saturday afternoon was as important as the scheduled portions. Five full hours “off” to reconnect, to debrief, to walk, to explore Newport, to take a nap, to watch the Olympics . . . it was a “design your own afternoon” block of time, contributing to the “retreat” aspect of this conference. We feel that most couples need time together as much as they need input, so we purposefully build this time in. Thankfully the weather cooperated and most couples customized the time to suit their needs and/or wants. 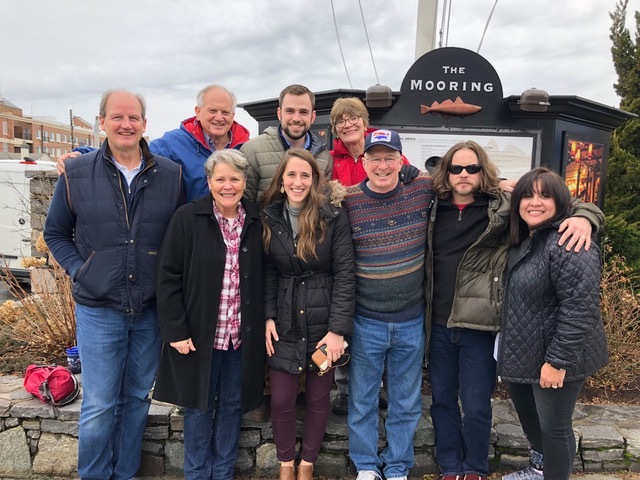 Taking advantage of moderate weather, we took the worship team and Don Hasselbeck out for lunch, hoofing it from the hotel. Of the 172 couples in attendance, 47 of them have been married 6 years or less! We love having these young marrieds take seriously a commitment to having an “annual marital check-up” which we propose at Engagement Matters. To honor these young marriages, we host a “young marrieds dinner” Saturday night and answer any questions they pose re: marriage. Rob and Gabby Warren joined us for the Q and A panel and some great insights were shared. Rob and Gabby Warren and Paul are pictured here with the young married’s dinner during the Q and A time. 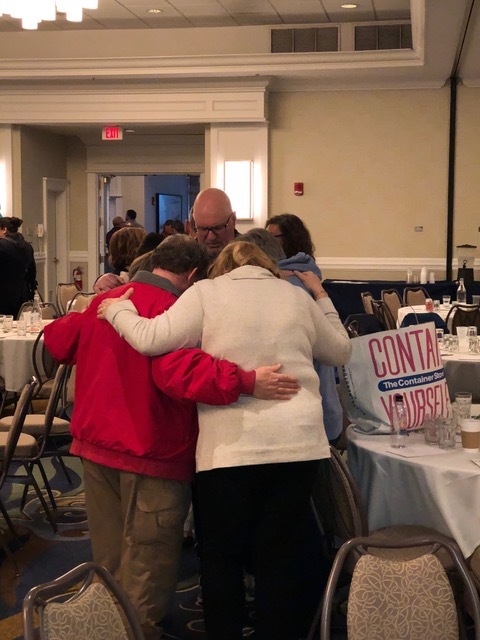 The final session was powerful as the couples were challenged to see their marriage through the lens of His design, with kingdom purposes to fulfill. We reminded them that God is bigger than their problems/challenges and that their hope is in Him. The worship band played a final set, couples were prayed over, and all too quickly the conference ended. Parting is such sweet sorrow . . . circling up in prayer. Berea family campers had a mini-reunion at the conference. Well, at least our time at the hotel ended. Our prayer is that the conference “went home” with each couple, in some measure or form. That each couple would make a commitment to focus on one area of change they would work on in the weeks and months ahead, and that by next year, they would have a better marriage. By His grace and for His purposes. The struggles are real. The brokenness is evident. The enemy is on the prowl.